A Folding the seat forwards fully First push the head restraint as far down as it will go . Move the seat as far back as it will go . Pull the loop on the back of the seat in the direction of the arrow. Fold the seat forwards. Folding the seat back. Pull the lever in the direction of the arrow. OR: Pull up the loop on the seat A to release the catch on the securing rod. Take the securing rod out of the seat and place it in the floor anchoring. Fold the complete seat back until it engages. Pull the loop on the side of the seat and fold the backrest back. 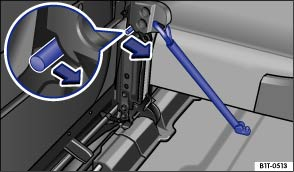 OR: Pull the loop on the back of the seat in the direction of the arrow and fold the backrest back. Adjusting the head restraint . Injuries could be caused if the seats are folded backwards carelessly. Always keep hands, fingers, feet or other body parts away from the seat area when folding the seat backwards. A seat that has not been secured properly could become loose in an accident. After installing the seat, pull it upwards to check that the catches are securely engaged. The seats in the second row of seats can only be folded forwards if the seat is first moved back fully.